Architects and designers at New Practice Studio, New York City and Shanghai (newpractice.com), aimed to blend an ancient tradition with contemporary design when creating the blueprint for authentic Sichuan hotpot restaurant, Tang Hotpot, in New York. Hot pot is a Chinese cooking method, prepared with a simmering pot of soup stock at the dining table. Ingredients are placed into the pot and cooked at the table. 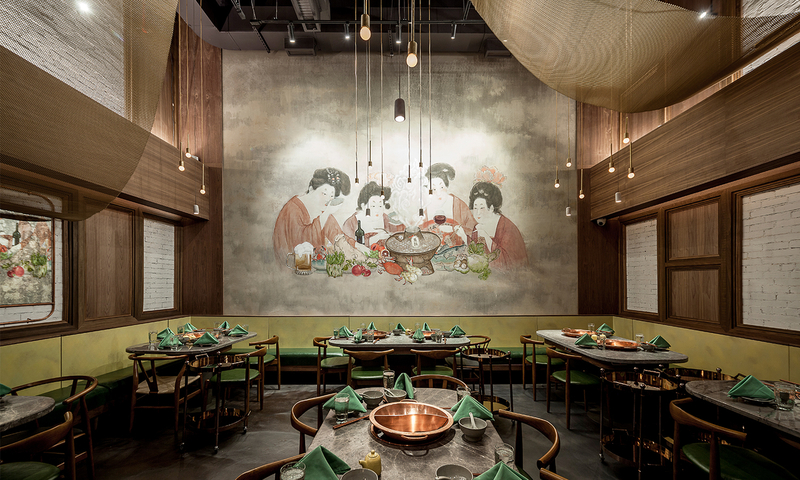 The restaurant’s modern design is evident, but the design team achieved a traditional Chinese aesthetic with shimmering copper pots crafted by Chinese artisans and a Tang Dynasty mural displayed on the central wall. The 20-ft.-high ceiling called for a unique material to sculpt the open area, adding dimension and texture to the main dining space. Founding Partner of New Practice Studio, Nianlai Zhong, wanted a metal fabric system that could be offered in a gold finish and suspended from the ceiling. Zhong specified Cascade Architectural Fabricoil® systems in 5/16-in., 15-gauge aluminum-coiled wire fabric with a Satin Gold finish. The fabric panels—460 sq. ft. in total—are secured with Cascade Architectural’s Avenue engineered attachment system using aluminum top and bottom channels. “Working with Cascade Architectural, we specially designed the geometry and installation detail of the coiled-wire fabric panels so that they can float in the air in a dynamic way, compared to regular vertically hung panels,” said Zhong. At Tang Hotpot, Fabricoil® adds a layer of translucency and mystery to the space, while integrating perfectly with the restaurant’s modern design. Fabricoil® also reflects light in various directions for a beautiful diffusion throughout the dining area. At the entrance bar, a tunnel made of copper tubes frames the path into the main dining area, while supporting custom-made ceramic artifacts. The main dining area with a spectacular 20-ft. ceiling, is characterized by its semi-circular banquette seats surrounding the hotpots. The space is highlighted by the shimmering artisan-crafted copper pots, and the floating copper mesh screen interplays with the walnut, painted brick, and copper-framed mirrors of the back wall. 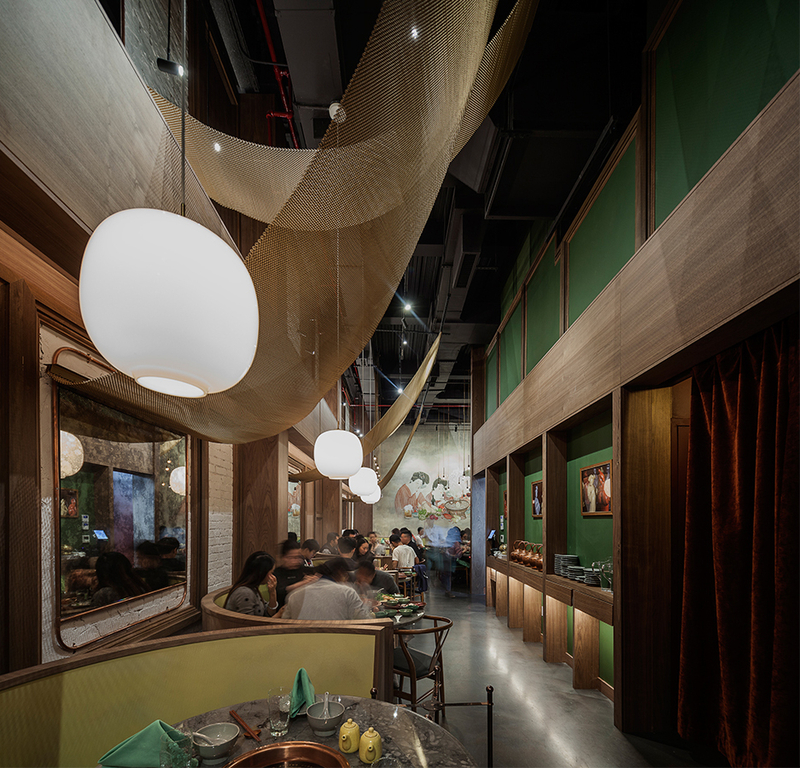 The central wall of the dining space features a contemporary interpretation of a Tang Dynasty mural. A private-dining mezzanine overlooks the main dining area and the busy Chinatown streets. 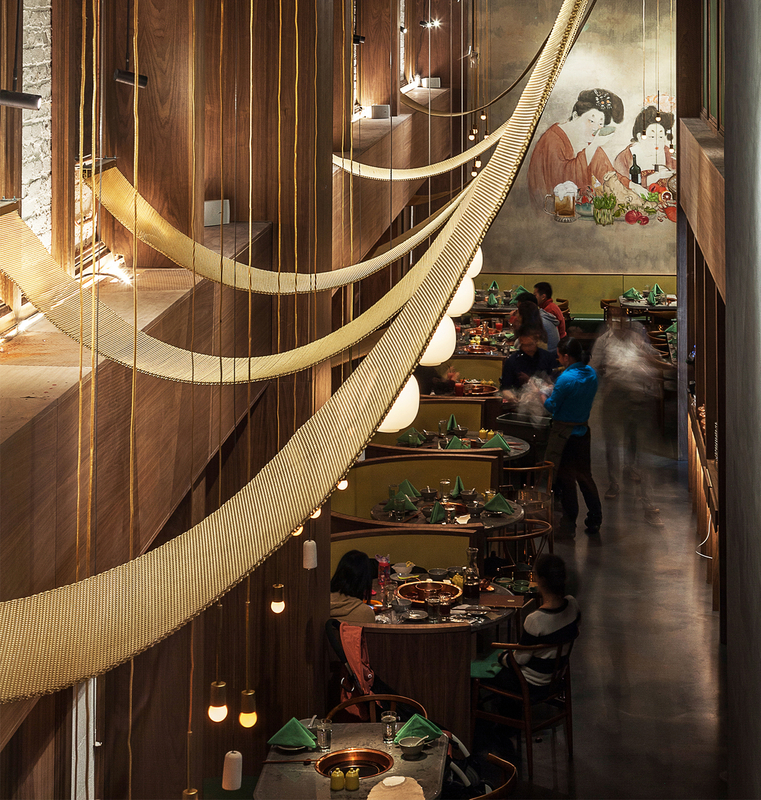 Tang Hotpot is a place of reversed fusion, where contemporary design is assimilated into an ancient dining tradition to create an exciting experience of both history and modernity, according to the architect.